With kale everywhere we look these days, many people are already aware of the many benefits of this luscious leafy green. Just one cup of kale provides more than the Recommended Dietary Allowance (RDA) of vitamin C and vitamin K, more than half of the recommended potassium, one third of the recommended folate, and a healthy dose of calcium, dietary fiber, and host of other micronutrients. All this for less than 40 calories! As an added bonus, kale is a beautiful and an easy-to-grow addition in the home garden. Kale grows well nearly year round. You can find various varieties of kale at farmers markets and grocery stores all around the country, making it an affordable and accessible option for those long winter months. 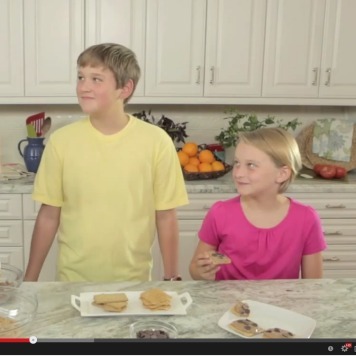 Pair new foods with familiar flavors, ingredients, and cooking styles that kids already enjoy. 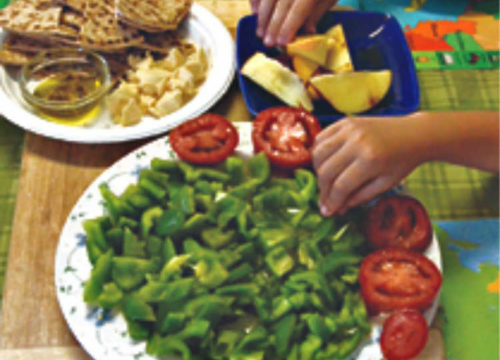 Allow children to help in the cooking process and meal planning. They’ll be even more likely to taste something new. Use the freshest ingredients you can find for the best possible flavor. To reduce bitterness, avoid overcooking kale and other leafy greens. The following recipes provide great opportunity to get the whole family involved in the cooking process. In no time at all, your family will be cooking, eating and enjoying the benefits of kale. Cooking with kids tip: The avocado in this recipe helps break down the kale, making it more tender and palatable. Kids love to participate in the “squish” part of preparation. Feel free to add your family’s favorite salad ingredients or use a favorite dressing. Place rinsed and dried kale leaves into a large bowl. Cube avocado and distribute evenly on top of kale. Using clean hands, massage (or “squish”) avocado into kale leaves, generously rubbing avocado into both sides of each leaf. When leaves are well coated, set aside for 10 minutes. In a separate bowl, whisk together dressing ingredients until well combined. When ready to serve, divide kale amongst four salad bowls. Distribute shredded carrot, tomatoes, cucumbers, and sunflower seeds amongst bowls. Drizzle with honey mustard dressing. Serve and enjoy. Cooking with kids tip: Kids can help wash and dry kale and tear leaves into pieces. They can also help toss the kale in the oil and seasoning. Give children the opportunity to smell the different seasonings and pick the one that most appeals to them. Spray 2 large baking sheets with cooking spray or line with parchment and set aside. Thoroughly wash and pat dry kale. Remove tough stems from kale and discard. Tear kale leaves into 2 inch pieces. Place torn leaves in a bowl and spritz or drizzle with oil. Toss to coat. Repeat with salt or seasonings (if using), starting with 1/4 tsp and adding more as needed. Spread coated leaves on baking sheet in a single layer. Bake for 10-12 minutes or until crisp. Rotate tray once half way through bake time and watch carefully to avoid burning. Nutrition Information (calculated with ½ tsp salt but no additional seasonings): Serves: 4, Calories: 84; Total Fat: 7 gram; Sat Fat: 1 gram; Carbohydrate: 4 gram; Protein: 2 gram; Dietary fiber: 1 gram; Sodium 310 mg. 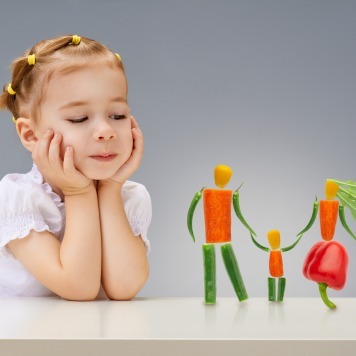 Learn the top 10 ways to get kids to eat healthier.